Donate To Sav-R-Cats | Sav-R-Cats International, Inc.
We go through a whole large bag of food every day at the adoption center. Food is also needed for the feral colonies and foster homes. Sav-R-Cats also greatly appreciates your generous monetary donation. 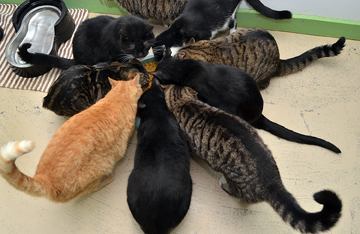 Your contribution will help us feed our feral cat colonies, provide medical care for our rescued cats and kittens, and help towards our ultimate goal of eliminating the feral cat crisis which we currently face. Without kind and caring people like you, we would not be able to continue our work. Thanks for your support of Sav-R-Cats and thanks for caring. For a further list of current needs or if you would like to donate your time, please call Shirley, our adoption center manager, at 843-222-8057.